Male Clogmia albipunctata. A moth-like dense coat of small hairs gives rise to the term "moth fly"
Drain flies, sink flies, filter flies, or sewer gnats (Psychodidae) are small true flies (Diptera) with short, hairy bodies and wings giving them a "furry" moth-like appearance, hence one of their common names, moth flies. There are more than 2600 described species worldwide, most of them native to the humid tropics. This makes them one of the most diverse families of their order. Drain flies sometimes inhabit plumbing drains and sewage systems, where they are harmless, but cause persistent annoyance. This family has 6 subfamilies that contain more than 2600 described species. The larvae of the subfamilies Psychodinae, Sycoracinae and Horaiellinae live in aquatic to semi-terrestrial or sludge-based habitats, including bathroom sinks, where they feed on bacteria and can become problematic. The larvae of the most commonly encountered species are nearly transparent with a non-retractable black head and can sometimes be seen moving along the moist edges of crevices in shower stalls or bathtubs or submerged in toilet water. The larval form of the moth flies is usually between 4 and 5 mm (0.16 and 0.20 in) long, and is shaped like a long, thin, somewhat flattened cylinder. The body lacks prolegs, but the body segments are divided into a series of rings called annuli (singular is annulus). Some of these rings will have characteristic plates on the dorsal side. The larval thorax is not significantly larger than its abdomen, giving it a more "worm-like" appearance than that of most aquatic insect larvae. In some species, the larvae are able to secure themselves to surfaces of their environment using "attachment disks" on their ventral side. Like mosquito larvae, they are unable to absorb oxygen through water and instead breathe via a small dark tube (a spiracle) located on their posterior end— they must regularly reach the surface to obtain oxygen. The larval stage lasts for between 9 and 15 days, depending on species, temperature, and environment. There are four instar stages.. In small numbers, the larvae are sometimes considered beneficial as their strong jaws are capable of cutting through the hair and sludge waste in drains which might otherwise form clogs. However, unless this sludge layer is removed entirely, the adult flies will continue to find it and lay more eggs. While the biting midges also have larvae that have no prolegs and which also have attachment disks, the larvae of the netwinged midges can be distinguished from those of the moth fly by the multiple deep lateral constrictions of the latter. The pupal stage lasts only for between 20 and 40 hours. During this stage, the insect will not feed but will remain submerged near the water surface, still breathing through a spiracle and soon metamorphosing into an adult fly which will burst through a seam in the pupal casing and emerge onto the water's surface. The adults are only half the length of the larvae, but are much broader in appearance, with a pair of hairy wings held pitched-roof-like over the body. The wings have the most elementary venation of any of the Diptera, having little more than a series of parallel veins without crossveins. The adults are typically nocturnal, though they orient themselves around lights and may appear to be attracted to light and odors. They are erratic fliers, and are often seen walking or running rapidly as well as taking flight. They are most active at night, but may also be seen during daylight, or near windows, lights, or illuminated display panels. The adults live for about 20 days, during which they will breed only once, often within hours of emerging from their pupal casings. Females will lay their eggs (between 30 and 100) just above the water line inside moist drains. Within 48 hours these eggs hatch into drain worms, the larval form. 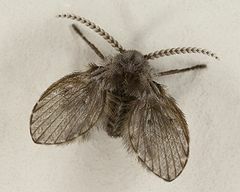 The drain flies which are commonly found in bathrooms, Clogmia albipunctata, are not known to carry any human diseases, but have been known to be an opportunistic agent of myiasis. However, the subfamily of Phlebotominae does feed on blood with the ability to transmit (tropical) diseases, and Sycorax silacea can transmit microfilaria. Inhalation of insect fragments may cause respiratory asthma. Protected by the extremely fine water-repellent hairs covering their bodies, adults and larvae are difficult to drown, and are not affected by contact with most water-borne toxins such as bleach. Boiling water has little or no effect on the adults for the same reason, and even the eggs are highly resistant to both chemical or thermal assault. Eggs can also withstand periods of dehydration. Extermination of this household pest depends on the maintenance of clean household drains for a period of at least three weeks. Suspect drains can be identified by placing a glass jar or taping a clear plastic bag over them, and periodically checking for adult flies. A clear plastic cup coated inside with vegetable oil or petroleum jelly can also be used. Partially covering the drain opening with sticky adhesive tape is another method used to identify breeding sources. Thorough mechanical cleaning of drains will remove the larval food source, and is the most effective control measure. Alternatively, injected foams containing bacteria or enzymes may be useful to break down gelatinous scum deposits. Besides sink drains, floor drains and shower drains are common sources, as well as leaky shower pans, but any location with moist decaying organic matter can be a breeding site. In commercial buildings, sump pump pits, sewers, and elevator pits may trap moisture where drain flies can breed. Because of their attraction to light, drain flies may be monitored by using fan-based traps baited with visible or ultraviolet light. However, only killing adult flies is usually not effective; larval food sources must be removed to stop more flies from emerging. ^ Quate LW, Vockeroth JR. Psychodidae. In: McAlpine JF, Peterson BV, Shewell GE, Teskey HJ, Vockeroth JR, Wood DM, eds. Manual of Nearctic Diptera. Vol. 1. Ottawa: Research Branch, Agriculture Canada, Monograph 27; 1981:293–300. ^ a b Javier Oscoz; David Galicia; Rafael Miranda (27 June 2011). Identification Guide of Freshwater Macroinvertebrates of Spain. Springer Science & Business Media. p. 138. ISBN 978-94-007-1554-7. ^ Quate, L.W. & B.V. Brown. 2004. Revision of Neotropical Setomimini (Diptera: Psychodidae: Psychodinae). Contributions in Science, 500: 1-117. ^ "How to get rid of drain flies". Retrieved 2018-07-03. ^ a b W. Patrick McCafferty (January 1983). Aquatic Entomology: The Fishermen's and Ecologists' Illustrated Guide to Insects and Their Relatives. Jones & Bartlett Learning. p. 297. ISBN 978-0-86720-017-1. ^ Denny Schrock (31 January 2004). Ortho home gardener's problem solver. Meredith Books. ISBN 978-0-89721-504-6. Retrieved 1 August 2011. ^ a b c d Townsend, Lee. "Drain Flies or Moth Flies". Entomology at the University of Kentucky. University of Kentucky. Retrieved 2017-06-21. ^ a b c d e "Get Rid Of Drain Flies | Drain Fly Control Treatment". Do It Yourself Pest Control. Retrieved 2017-06-21. ^ Schulz-Stübner, Sebastian, et al. "Psychodidae (Drain Fly) Infestation in an Operating Room." Infection control and hospital epidemiology 36.3 (2015): 366-367. Quate, L.W. 1955. A revision of the Psychodidae (Diptera) in America north of Mexico. University of California Publications in Entomology. Quate, L.W. & B.V. Brown. 2004. Revision of Neotropical Setomimini (Diptera: Psychodidae: Psychodinae). Contributions in Science, 500: 1–117. Vaillant, F. 1971. Psychodidae – Psychodinae. In: E. Lindner, ed. Die Fliegen der Palaearktischen Region, 9d, Lieferung 287: 1–48. Young, D.G. & P.V. Perkins. 1984. Phlebotomine sand flies of North America (Diptera: Psychodidae). Mosquito News, 44: 263–304. Wikimedia Commons has media related to Psychodidae. Copyright © 2019 Sydney Pest Management. All Rights Reserved.